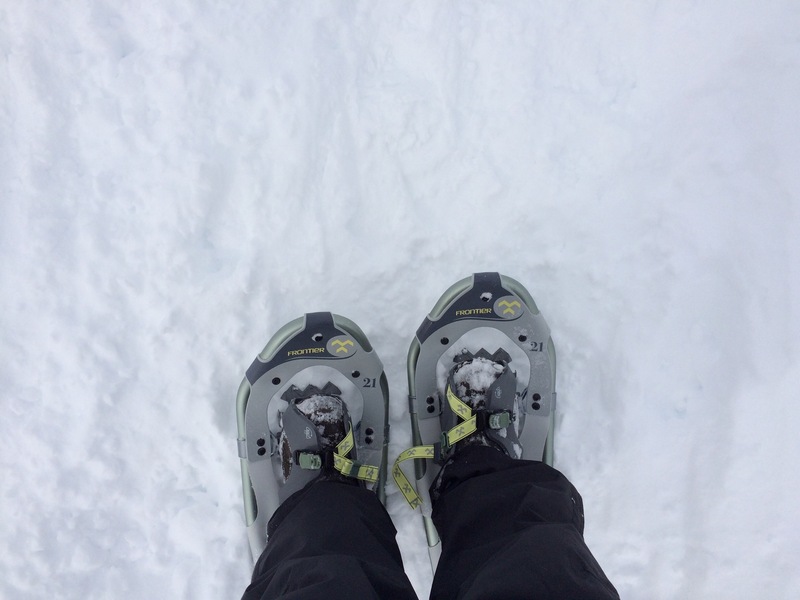 The best way to survive a Maritime winter is to try to find some enjoyment in it. That means getting outside and spending a (hopefully) not too cold day doing some winter activity. 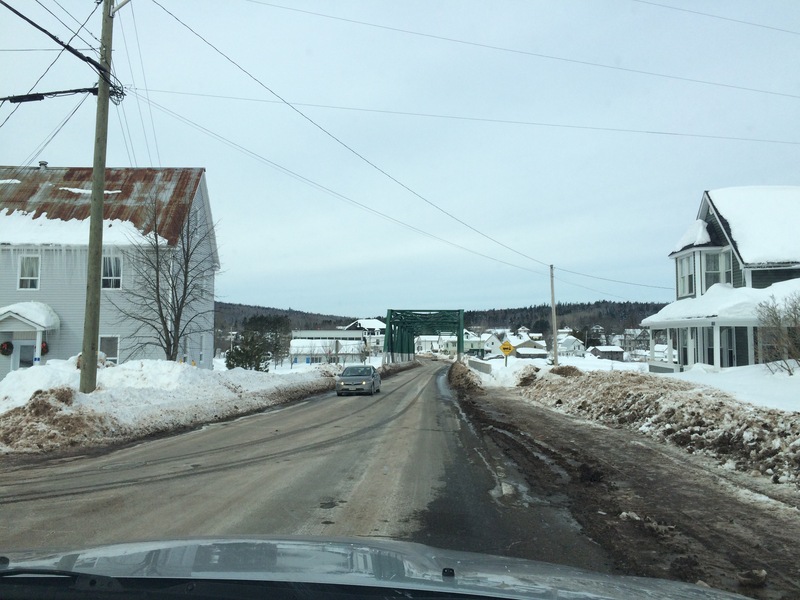 This Sunday started out sunny and eventually went overcast but the temperature was comfortable at around -5 Celsius. 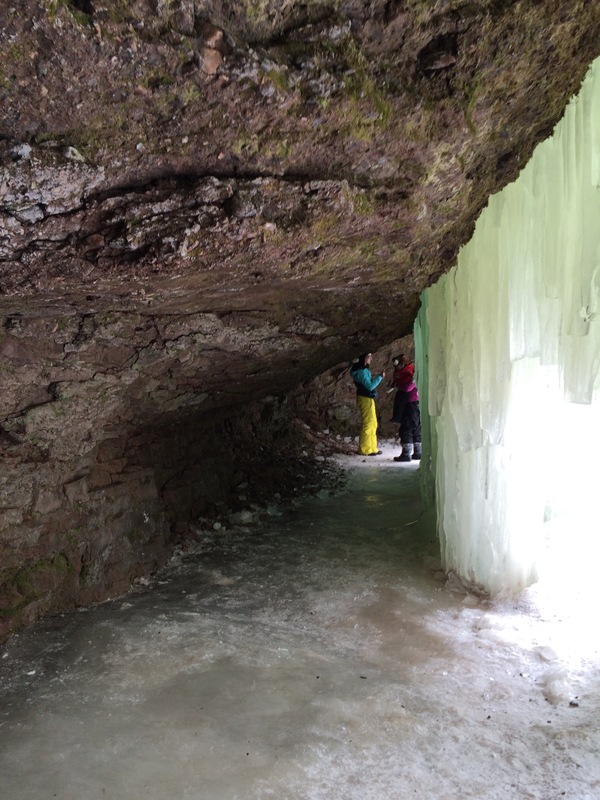 So we hopped in the car and headed for the Midland Ice Caves. Joel and I usually try to make the hike into the Ice Caves at least once a winter and we decided that today was as good a day as any. One of the truly wonderful things about living in the Maritimes, and New Brunswick in particular, is all the great hiking you can find close by. Making our way to Midland. Apparently many others had the same idea. When Joel first took me into the Ice Caves several years ago, there was hardly anyone else around and there was very little signage. 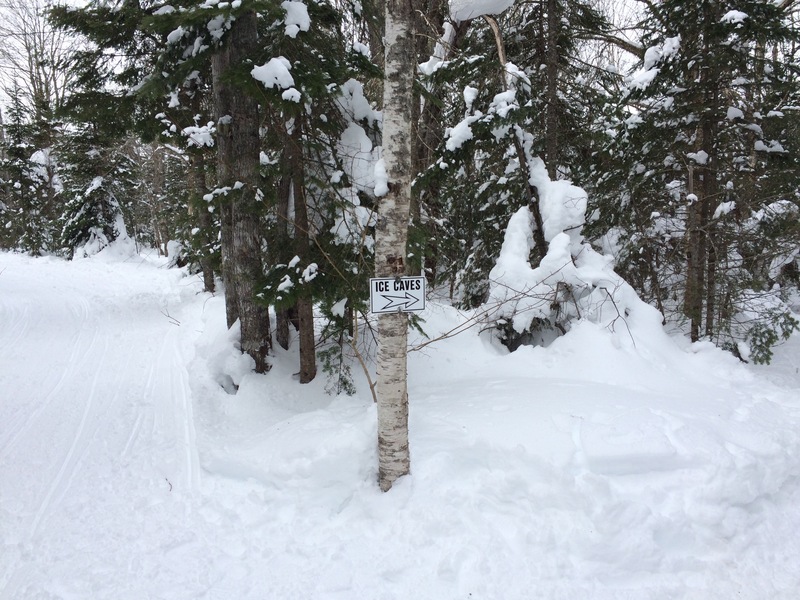 People have caught on now and the trail is heavily traveled and the way is well marked with signage. I can’t blame them. 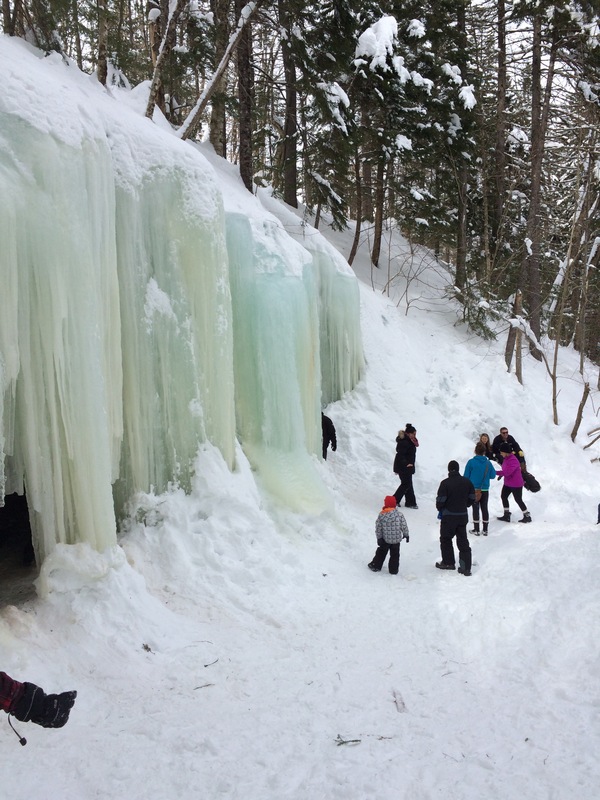 A trip to the Ice Caves is great family fun. Kids bring their crazy carpets and sometimes the family dog comes too. 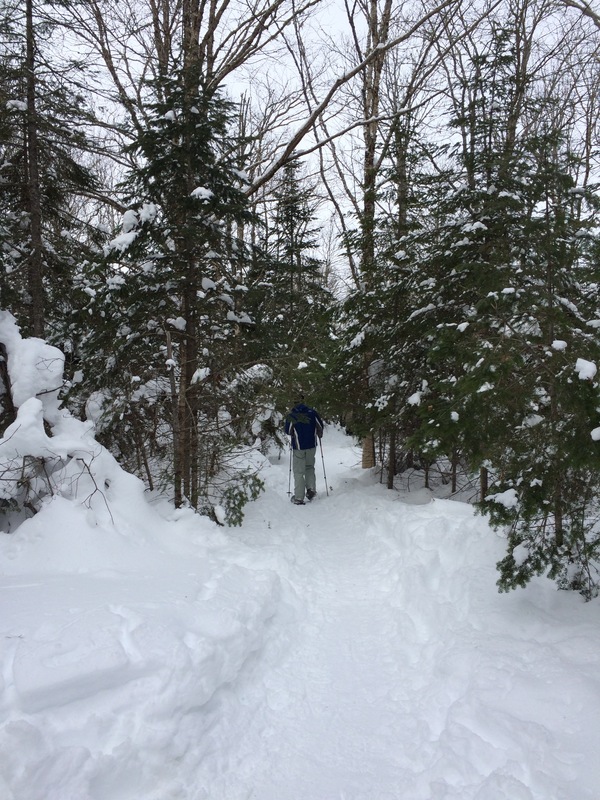 The Caves are a good hike across a field, up a hill, and into the woods following a snowmobile trail. It’s a long climb all the way to the top of the tree line. Starting to regret all those hours binge watching Netflix instead of going to the gym. Last part of the hike into the caves. 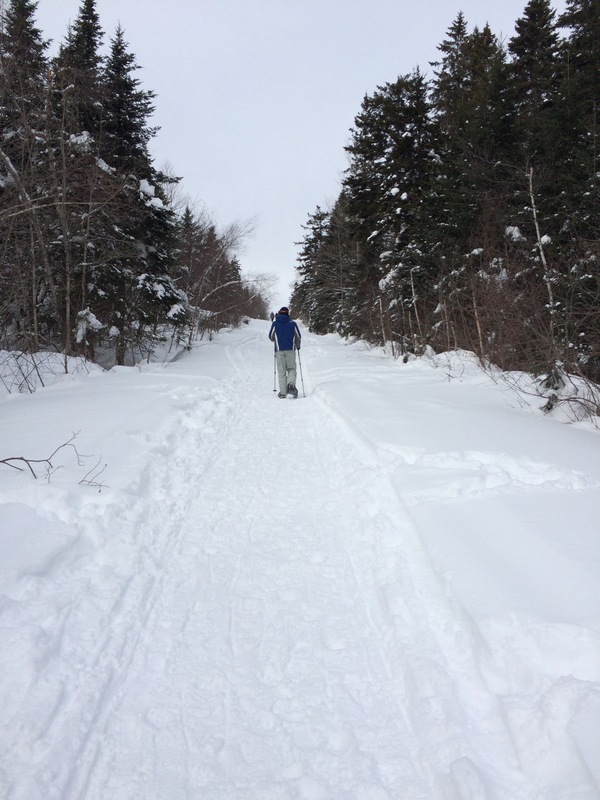 Snowshoes are helpful but not really required, since the trail, at least from the top of the hill, is well groomed. 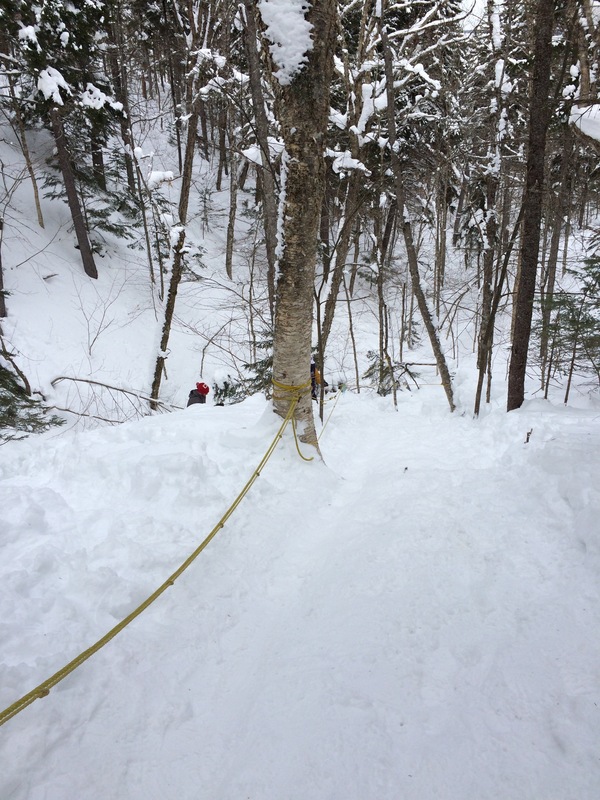 Once there, it’s a steep climb down to the base of the caves, made easier by the use of a rope strung from tree to tree. The caves are not really caves at all, but are formed by water running over the edge of a cliff, creating a thick sheet of ice that walls in a small ledge. Nevertheless, they’re quite impressive. Several entrances are usually hacked out so that you can get inside. 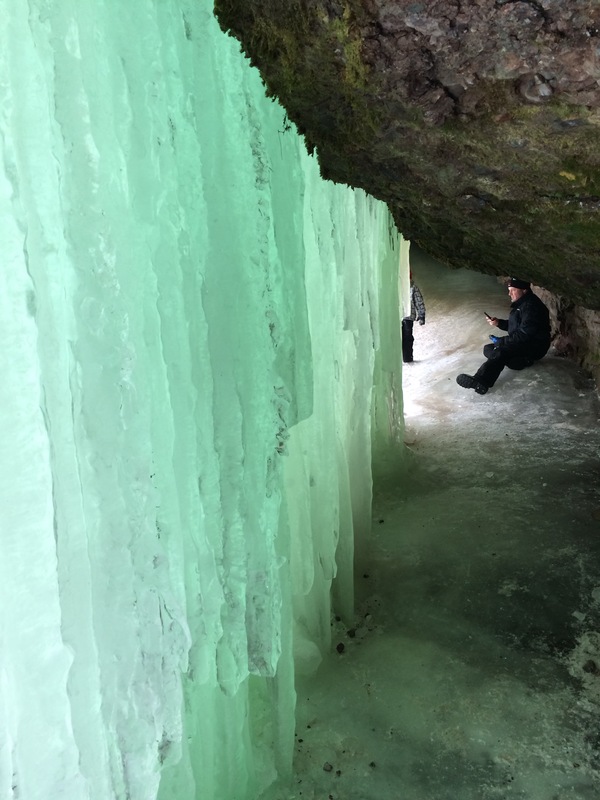 The ice glows greenly from the inside and is layered in sheets. Careful walking inside as it’s a sheet of ice from top to bottom! Looks a bit otherworldly in here. View from the other side of the cave. We set up a hammock at the top of the hill leading down to the caves and enjoyed a nice rest and a snack before starting the long hike back to the car. A place to relax with a great view. 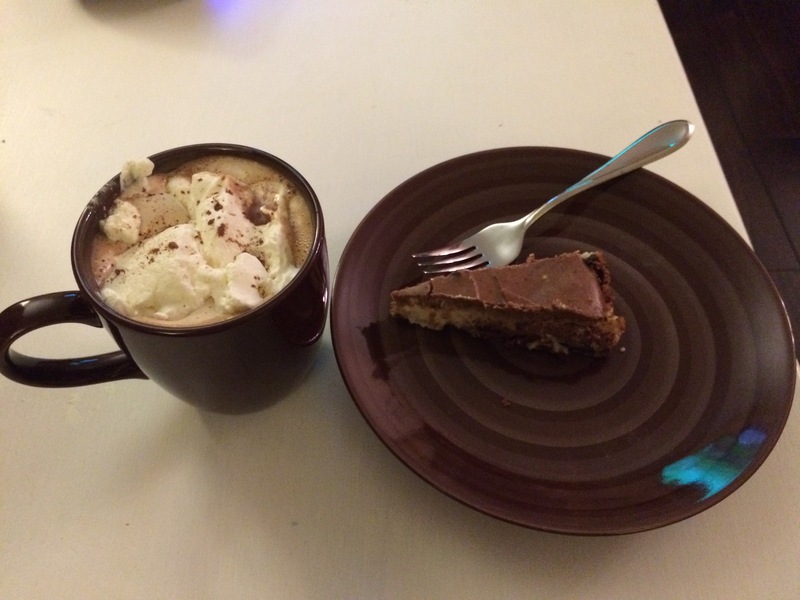 We felt we earned a treat, so when we got home we had a delicious hot chocolate and a piece of cheesecake. 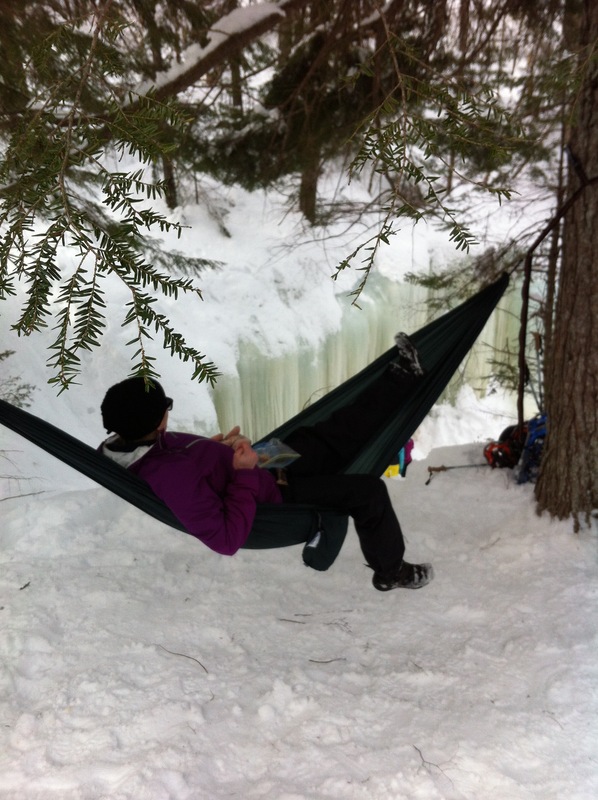 If I always get this kind of reward, I’ll make the hike to the Ice Caves every day! 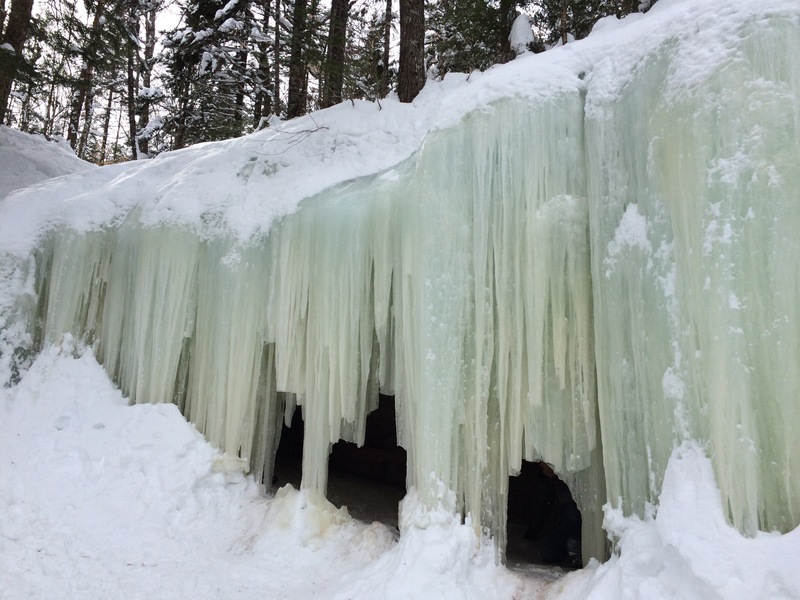 UPDATE: As an update to this post, I would like to remind everyone that is heading out to the Midland Ice Caves to give the right of way to the snowmobilers while on the snowmobile trail. 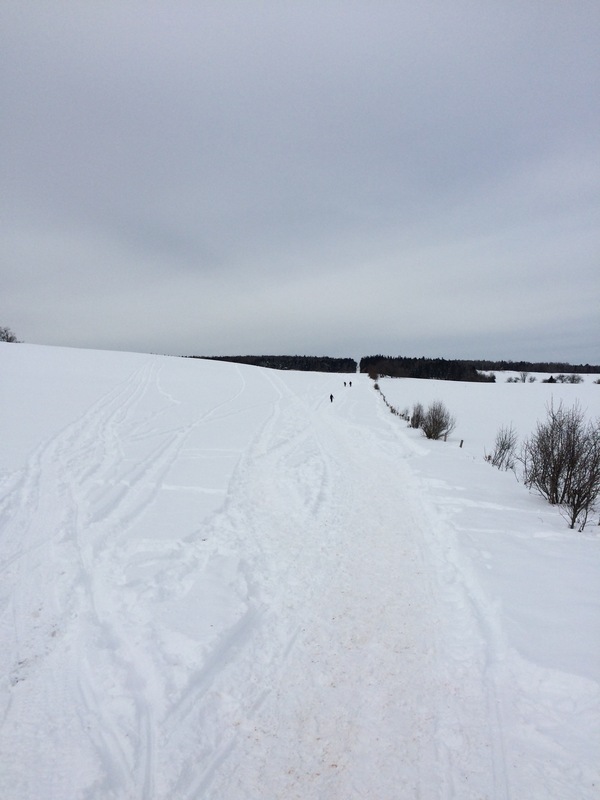 The snowmobilers pay to maintain this trail so please move off the trail when you hear or see one coming through. Be safe and have fun! Gorgeous photos. 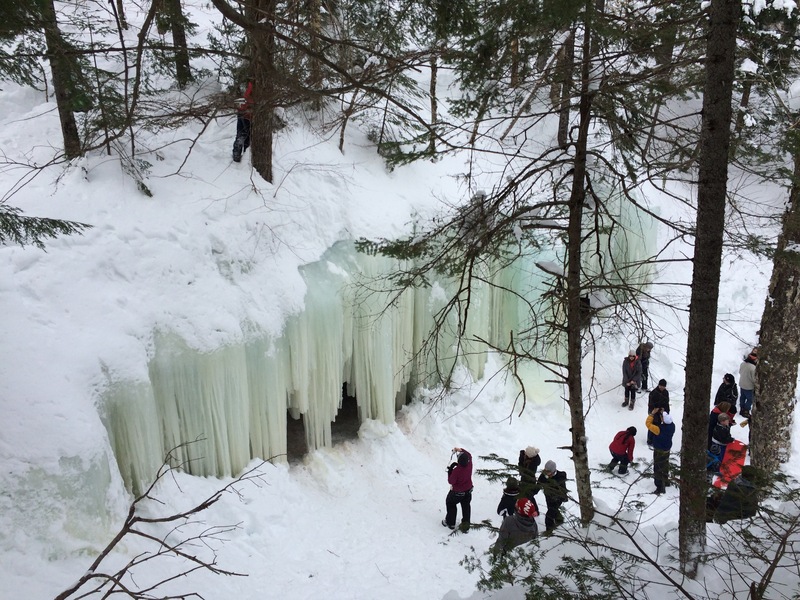 Love the ice caves.